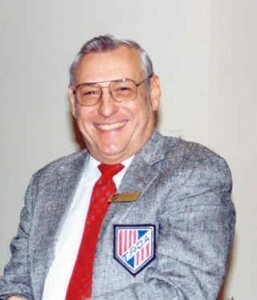 Lieutenant Colonel Ron Green was born in Aberdeen, SD, then had short moves to Wyoming and Nebraska. While in Nebraska he lived under a final approach to the runway there. This was a ‘top-off’ base that had bombers and fighters that flew each day. Ron looked up at the airplanes in the sky in ‘42 and set a goal of becoming a fighter pilot. This goal was realized in ‘60 when he earned his wings and became a fighter pilot in the F-100. 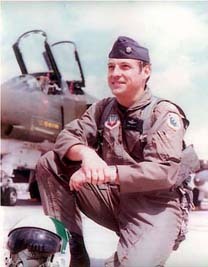 Although Col Green took time off from the cockpit to obtain a Masters Degree from ASU in 1973 and served in the Pentagon from ‘74-‘78, he stayed a fighter pilot until retiring in 1980. During this time, he flew 3150 hours in the F-100 and 900 hours in the F-4. He flew out of or over most countries of the world. This included 3 tours in Vietnam and totaled 292 Combat Missions (232 in the F-100 and 60 in the F-4) without sustaining a single hit. Although one day he can remember a missile going by the canopy so close that he could see the access panels needed a blade screw driver. On his 4th mission he also winchestered (depleted the gun ammo) engaging a Mig-17. The 37mm guns blink while 23mm guns put out a steady stream of fire. Yes, you can see the bullets go by! Colonel Green was later awarded the Distinguished Flying Cross for Heroism during aerial flight. To read more of his service in Vietnam, please click on Green At War. Colonel Green had many ocean deployments that used the KB-50s and KC-135s. He remembers these as hours of boredom interspersed with short periods of extreme fright refueling. Refuelings most memorable involved chasing a KB-50 down by following the exhaust in the clouds and using the F-4s radar for join up in the clouds behind a KC-135 over Thailand. In both cases, there was no abort base available. The longest deployment lasted for 10 and 1/2 hours and required 5 aerial refuelings. Colonel Green retired from the Air Force in 1980 and went to work at McDonnell Aircraft in St. Louis, MO. While there he flew thousands of hours in the domed simulators and became the chief Threat Pilot in current and hypothesized future Mig Aircraft. His involvement in two projects there resulted in his being awarded the President’s Award twice. As he said, “Too bad the awards were not money instead of certificates and plaques.” Health problems finally resulted in forcing him to retire/retire in 1994. Colonel Green moved to the valley and became involved with the Arizona Chapter of MOAA. After a year of Chapter inactivity he agreed to be the 1st Vice President for 3 years and then became the president. He figures that he will be involved in MOAA and Veterans affairs as long as he can get around! Ron was inducted into the Arizona Veterans Hall of Fame, Class of 2013.